Back from the US and time for some good ol’ Melbourne Fried Chicken. 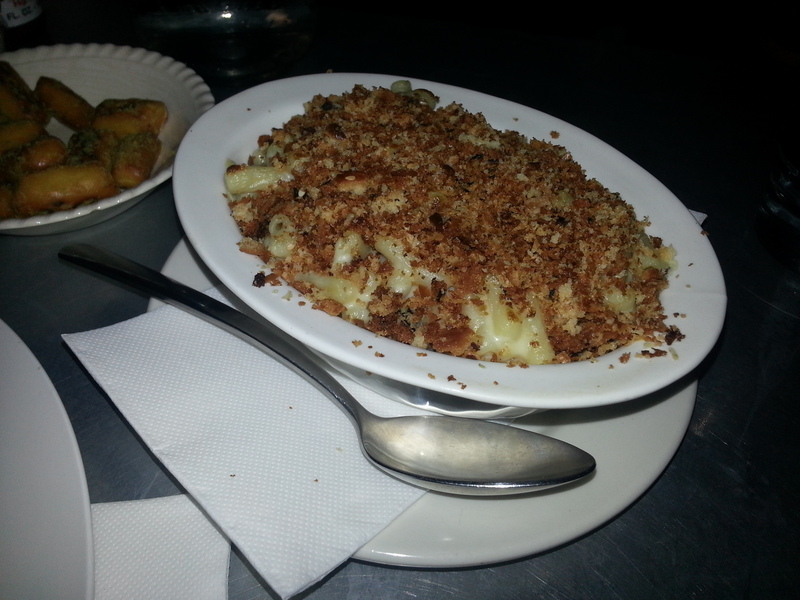 Next on the list: Belle’s Diner on Gertrude Street in Fitzroy. What better way to celebrate a return to Melbourne than greasing up with some delicious Melbourne Fried Chicken. 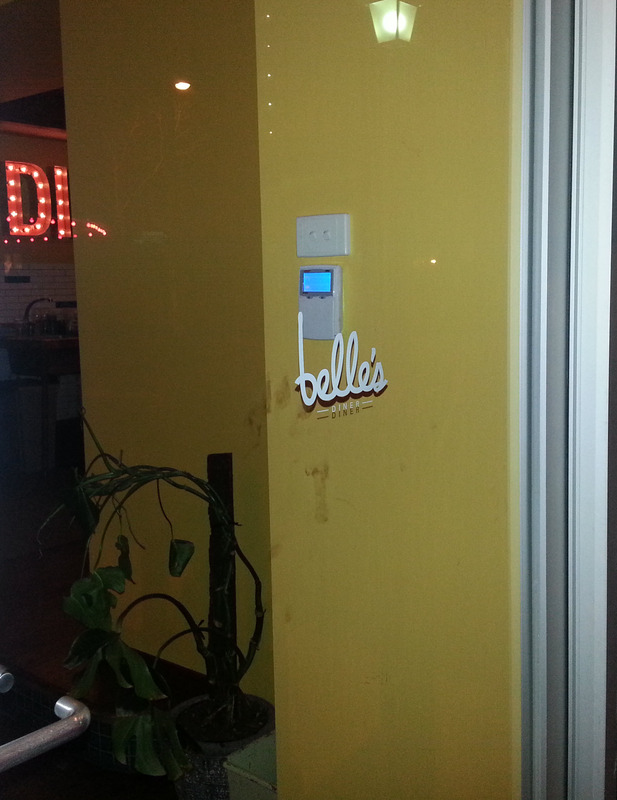 Belle’s is a diner style joint with a discrete sign. 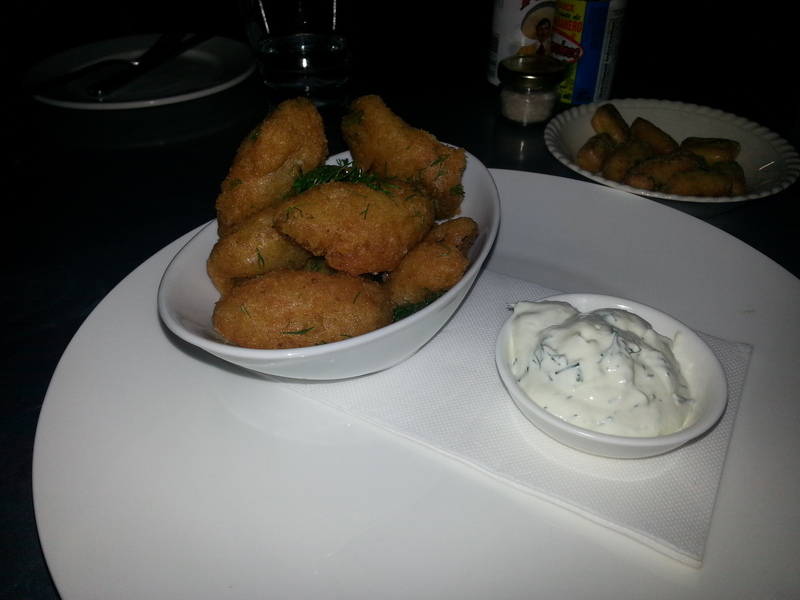 We settled in at the bar since the tables were all reserved and the Chick wasted no time ordering deep fried pickles. After perusing the menu the full order went in: side green salad, mac n’ cheese (feta, gouda and cheddar), Jalapa Burger (with Jalapeños) and the Southern Fried Chicken with Slaw accompanied with Sparkling white wine and a Hawthorn Pilsner. 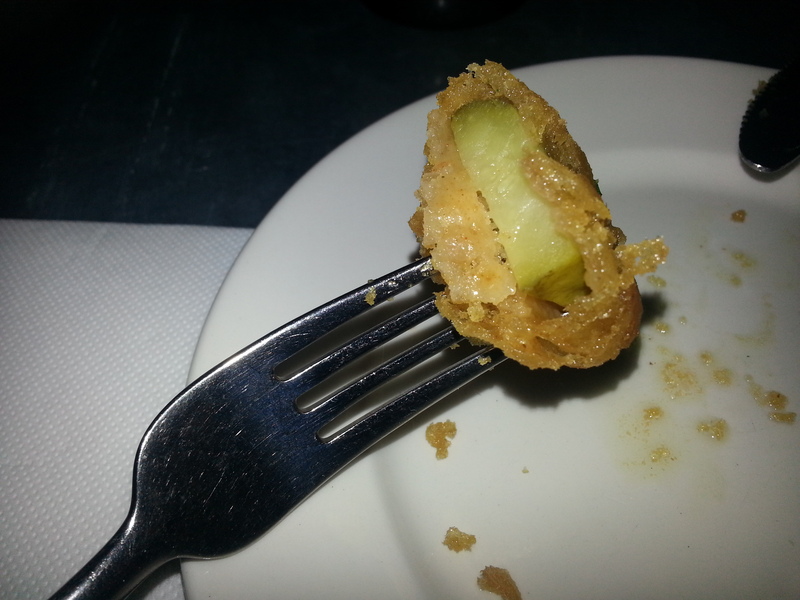 The fried pickles came out quickly and The Chick fell in love with them. A little hot sauce and the creamy dip mixed well with the salty/sour nuggets. Order these! Shortly afterwards the rest of the food came out. 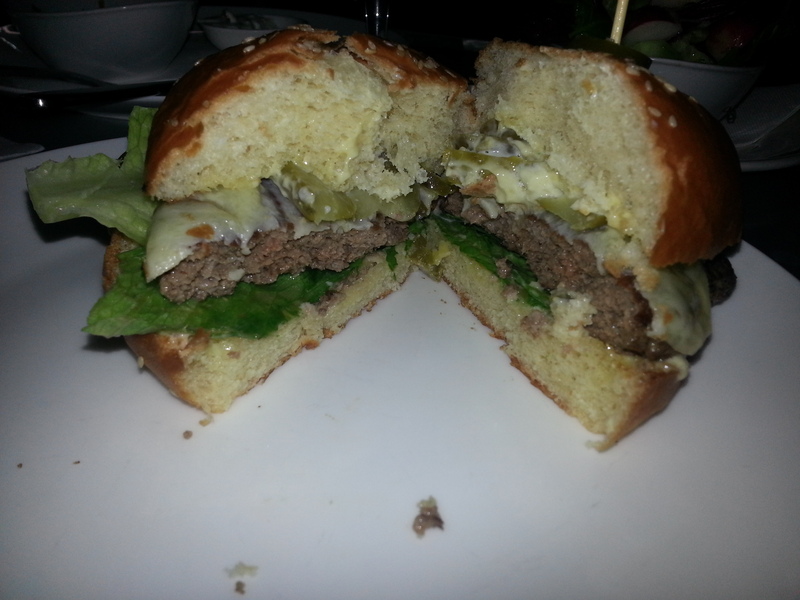 The Jalapa burger was ok, our main beef: it was a bit too bready and on the under cooked side. 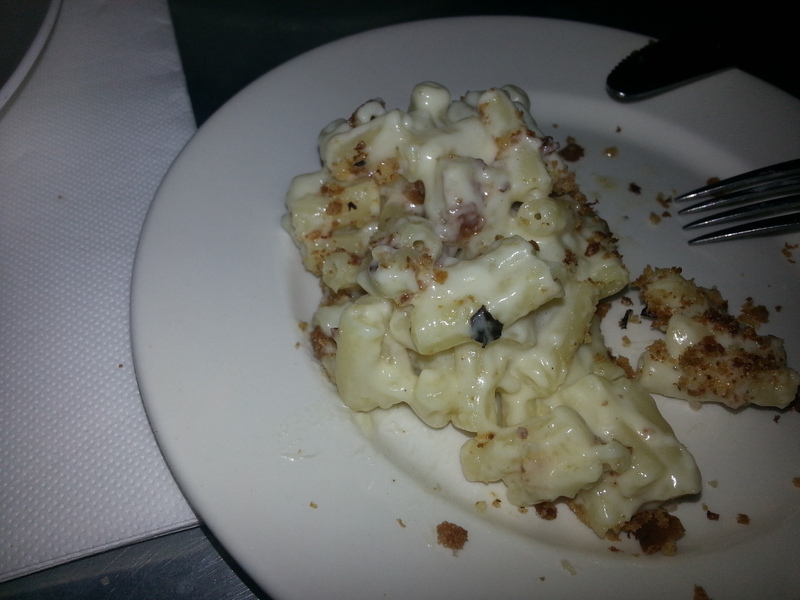 The mac-n-cheese was perfect: cheesy and creamy in all the right places and came in a generous portion with a crispy/salty breadcrumb topping. The fried chicken was more tenders-style, no bones. It was about 6-8 pieces, single coated, lightly spiced, fresh and steamy. It was a bit over salted but that didn’t stop up from smashing the whole plate. The nice twist to it were the sides of tasty BBQ sauce (smokey and a touch sweet) and the slaw (a healthy portion). 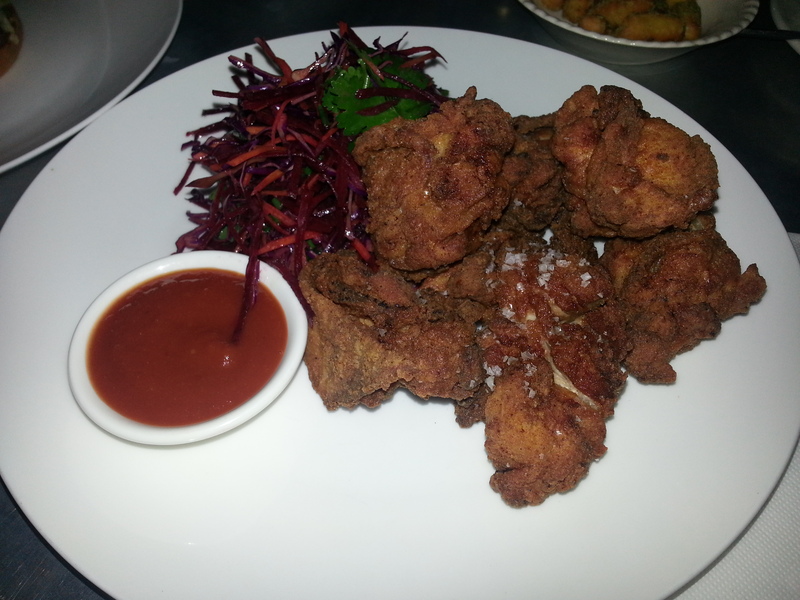 The chicken was good but didn’t compete at the top of the class with other Melbourne Fried Chicken contenders. Conclusion: Belle’s diner is a cool place with a retro style vibe, quick service and good food. 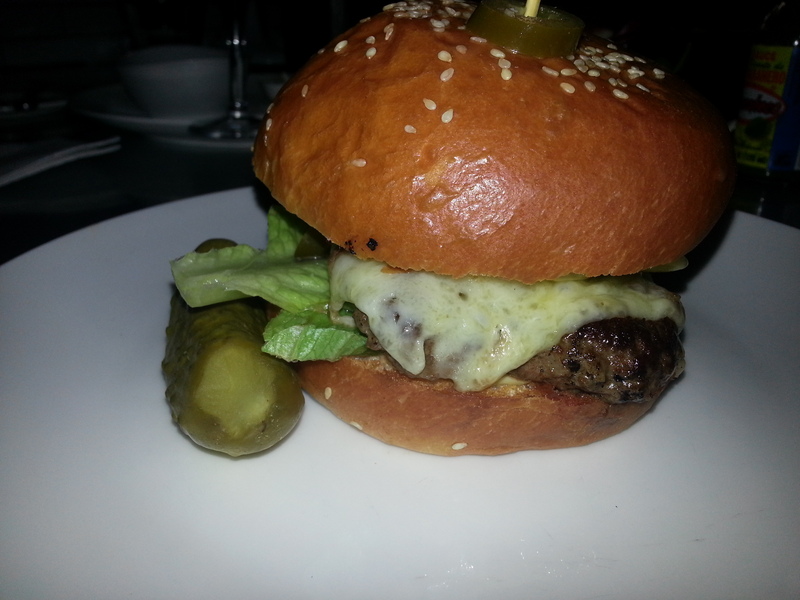 It has some good menu options to offer and is well worth a visit. 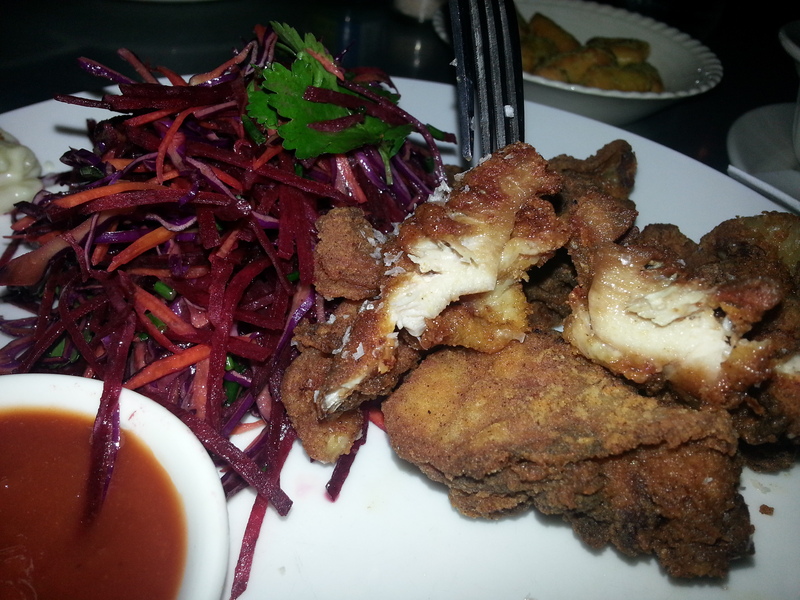 The fried chicken is above average and will fill you up so give it a try! We were on an epic road trip in the US and we were somewhere between Las Vegas and the Grand Canyon in a town called Williams, Arizona. We were tired and hungry. Hollywood was eager for his first Authentic American Diner experience and was informed by The Chick that they generally are a hit and miss (mostly miss). We were also on the famous Route 66 and that’s where we found Goldie’s Route 66 Diner. We were a gang of four but only Hollywood was bold enough to order the Chicken. 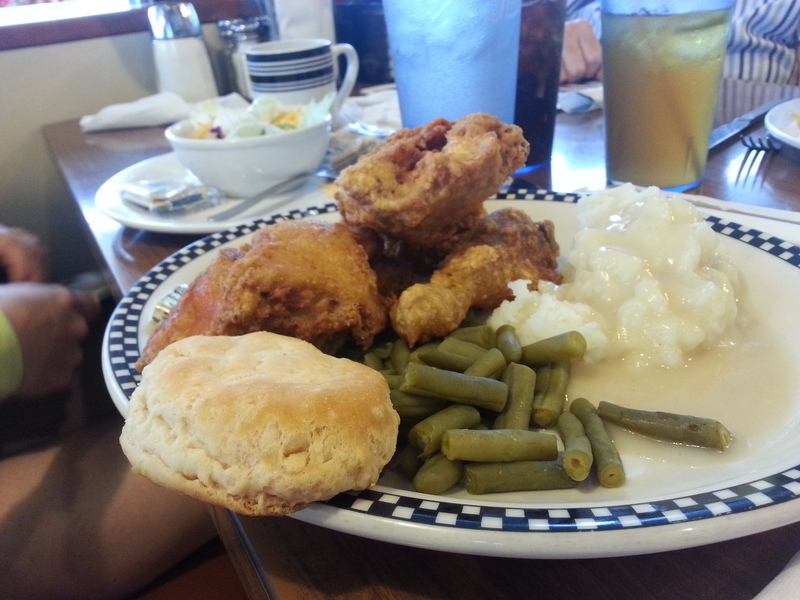 It was lunch time but the chicken was in the dinner section of the menu, cooked in the diner’s “homemade batter”. 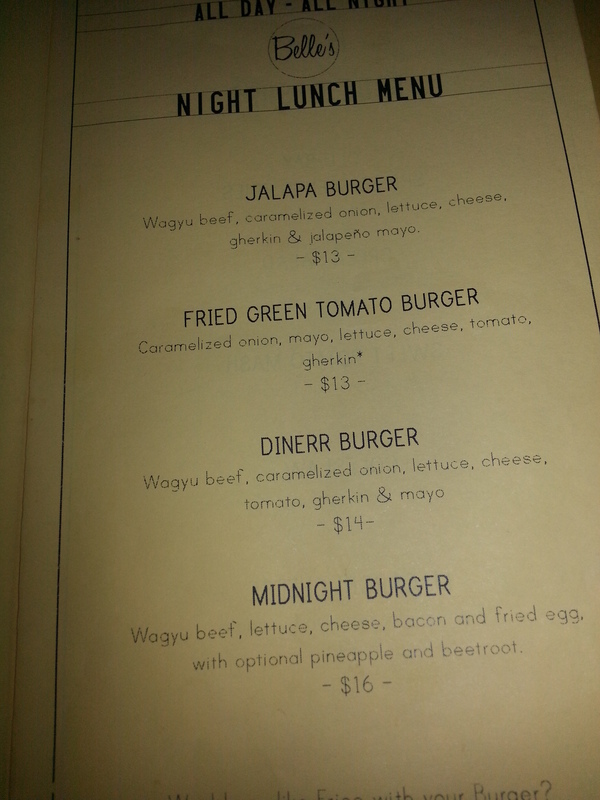 Thankfully, the waitress allowed us to order any of the items on the menu regardless of time of the day. 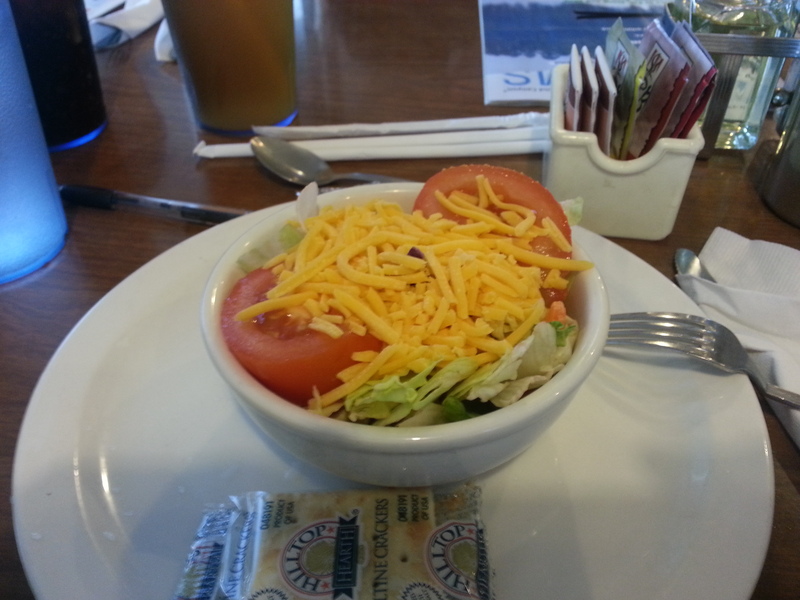 The Chicken came with a very basic “salad”, bland lettuce, tomato carrot and a heaping of pre-shredded american cheese. The sides were mashed potatoes and gravy, canned green beans and biscuits. At first the chicken seemed fresh and hot however after delving deeper into the pieces we noticed that the pieces got cold really quickly which made us suspect that it may have been pre cooked and dipped in the frier. The chicken was average and only lightly spiced. 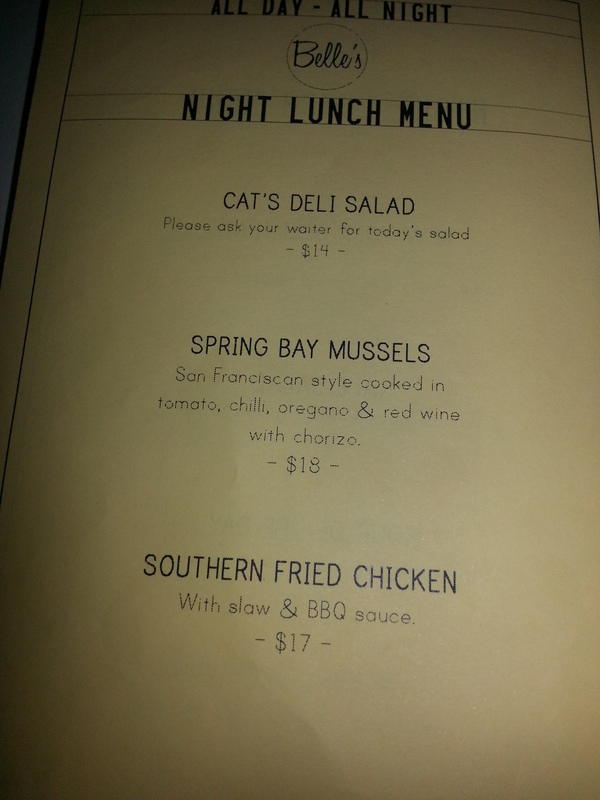 It was nothing special compared to our Melbourne Fried Chicken experiences. All the side dishes seemed bland and uninteresting. Most of the meal went uneaten. Now Hollywood knows that most American diners are a source of generic American fare and cannot compete for the favor of our foodie Australian taste buds. Thankfully there are specialty shops in America that do compete, but this was not one of them.